Hoverwatch free spy app is the first truly family-oriented phone tracking app for Android. Remaining invisible on your phone, Hoverwatch helps protect your kids by allowing you to discover their location at any moment, see where they’ve been an hour, two hours or a few days ago, look who they called to and access their text messages. Unlike similar apps, Hoverwatch allows full conversation recording, and makes accessing collected data as easy as logging in to your account. All this makes Hoverwatch a perfect tool for looking after your kids and safeguarding their mobile devices from loss or theft. Android market is full of tracking apps, call recording apps and fully blown surveillance suites. Unlike all those apps and services, Hoverwatch aims to include everything you need to look after your kids with no bloat and no complex configuration settings. Also you can use alternative Cell Phone Tracker by Snoopza. With Hoverwatch, you are getting all the essentials including tracking the phone on the map, location history, text messages, call information and conversation recording – all conveniently accessible by logging in to a single account. Many phone tracking apps offer “call logging”. However, call logging is very different from actual call recording. With logging, you only get information about the call such as who your kids talked to (via Caller ID), including time and length of the call. Hoverwatch brings call logging to the whole new level. Hoverwatch maps the location of each call based on your phone’s location sensors, allowing you to discover where your kids were when they made or received a call. Finally, Hoverwatch adds fully featured call recording, allowing you to record conversations made with your kids’ phone. You won’t need the actual phone to listen to your kids’ calls. Simply log in to your account, and you’ll be able to listen to their conversations with just a click. Hoverwatch tracks SMS messages sent and received, allowing you to read text messages in your account. Each message is accompanied by location information, enabling you to see the location on the map where each message was sent or received. In addition to phone tracking and call recording, Hoverwatch offers a feature that may come handy when tracking down a phone that was lost or stolen. Hoverwatch can take a photo of the person unlocking the phone, sending the image immediately to your account over a wireless network. As a result, if the phone is lost or stolen, you may be able to discover who has your phone. Needless to say the snapshot is accompanied with location information, allowing you to see where your lost phone is on the map at any given moment. 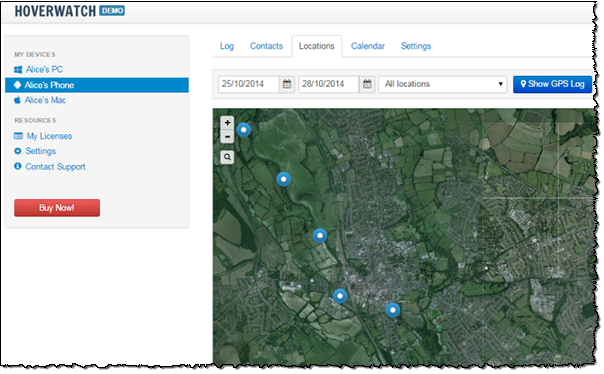 With Hoverwatch, you’ll have full access to all tracking information from a single place. Simply log in to your Hoverwatch account, and you’ll see where your kids are and what they are up to! Hoverwatch offers the choice of a map, allowing you to switch between OpenStreetMaps, Google Maps Road and Satellite views, allowing you to use the map service with the best coverage in your area. *Location information Location information is collected periodically and on each recorded event by using your phone’s GPS and/or AGPS receivers. Coordinates are transmitted to the server and stored in your account. The data is used to pinpoint the location of your phone on the map. *Call data Information about incoming and outgoing calls including identification of the other party (via phone/address book and/or Caller ID) is recorded and stored in your account. The data allows investigating your kids communication patterns. Incoming and outgoing phone calls can be recorded and stored in your account. This information allows you listening to your kids’ conversations from anywhere in the world. *Text messages Text SMS are recorded. They are available in your account. *Unlock snapshots Every time someone unlocks your phone, Hoverwatch can make a snapshot using your phone’s frontal camera. This may help tracking down your device if lost or stolen. These images are available in your account. You can try Hoverwatch free of charge for 3 days. If you like the service, we offer a number of subscription options (https://www.hoverwatch.com/free-cell-phone-spy).